These Farm Heroes level 421 cheats and tips will help you beat level 421 of Farm Heroes. 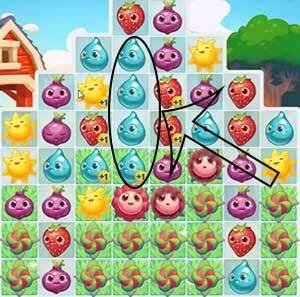 The objective of Farm Heroes level 421 is to reach 100% growth in 19 moves by collecting 22 flowers, 150 strawberries, 150 suns, and 150 water drops. Level 421 Cheat #1: Work that Sweet Spot for Maximum Flowers! The most difficult part of Farm Heroes Saga level 421 is the sheer number of flowers required to pass the stage. The player only has 18 turns to make some magic happen down in Farm Heroes world! My stars, however will this come to pass? 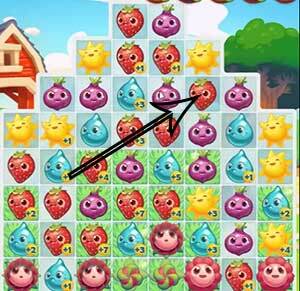 The astute eye will notice there are sections of the board in Farm Heroes Saga level 421 that are extra efficient at the task of clearing flowers. The two “sweet spots” in the arm pits of the stage can stimulate up to 5 flowers at once, which is a major achievement with so little time available on the level. After clearing the waves of flowers, there will be little time to collect the other required cropsies to win the stage. Try to make matches on the grass tiles underneath the flowers to double the value of the points the matches yield. Chain cropsy combinations are an invaluable tool on Farm Heroes Saga level 421. 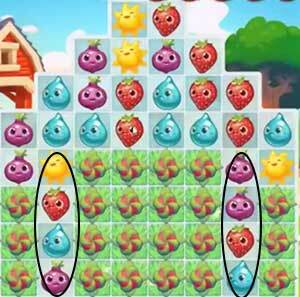 Chain cropsy combinations refer to matches made with 4 to 6 cropsies at once and provide unique bonuses to help the player beat the stage faster. The 4 and 6 chain cropsy combinations produce similar effects to differing magnitudes, but both help pwn Farm Heroes in its stupid face. These combinations spread +1 point bonus tokens across the board, increasing the value of future matches of required cropsies. The 5 chain cropsy combination is the ugly duckling of the chain cropsy family. Instead of dispersing point bonuses across the board, the 5 chain cropsy combination instead collects all cropsies of the matched subset. Talk about a sticky situation! It should be noted that levels in Farm Heroes Saga with higher percentages of inessential cropsies are less effected by chain cropsy combinations. This is because collecting extra points on these cropsies does not help the player complete the level at all. This is what we in the business refer to as a mondo disappointment. Level 421 Cheat #3: Don’t Collect Inessential Cropsies! On Farm Heroes Saga level 421 nobody has to collect onions. Just don’t do it, you’re wasting your own time. I thought you were better than this. Why don’t you just go back to the bridge and start shootin H again, huh? You might as well be shootin H because you’re wasting your life with these onion cropsies.